Onto this broken Western stage rides Michael Coughlin, a Civil War veteran with an enigmatic past, come to town to settle his dead brother’s debt. Together with his widowed sister-in-law, Elizabeth, bankrupted by her husband’s folly and death, they embark on a massive, and hugely dangerous, buffalo hunt. Elizabeth hopes to salvage something of her former life and the lives of the hired men and their families who now depend on her; the buffalo hunt that her husband had planned, she now realizes, was his last hope for saving the land. Elizabeth and Michael plunge south across the aptly named “dead line” demarcating Indian Territory from their home state of Kansas. Nothing could have prepared them for the dangers: rattlesnakes, rabies, wildfire, lightning strikes, blue northers, flash floods - and human treachery. With the Comanche in winter quarters, Elizabeth and Michael are on borrowed time, and the cruel work of harvesting the buffalo is unraveling their souls. 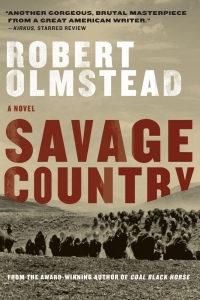 Bracing, direct, and quintessentially American, Olmstead’s gripping narrative follows that infamous hunt, which drove the buffalo to near extinction. Savage Country is the story of a moment in our history in which mass destruction of an animal population was seen as a road to economic salvation. But it’s also the intimate story of how that hunt changed Michael and Elizabeth forever.